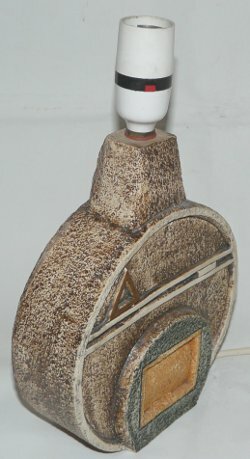 Stunning Troika pottery medium wheel lamp base decorated by Jane Fitzgerald. Jane Fitzgerlad (later Parson) worked at the Troika Pottery in Newlyn in Cornwall from c1976 until 1983. It has a brown overall base with the abstract decoration picked out in tones of orange, cream and green. On the front is a stunning sun design. This Troika lamp base stands approximately 21cm to the fitting and measures 17cm in diameter - it is a medium wheel lamp base. 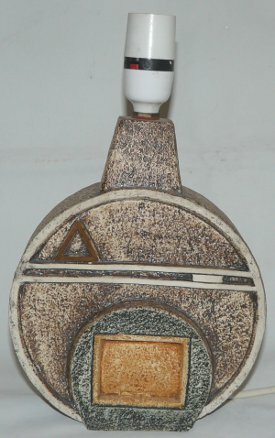 On the base of this Troika lampbase is the black painted Troika pottery mark, Troika Cornwall, and the initials of Jane Fitzgerald. It can be dated to c1976-1983. 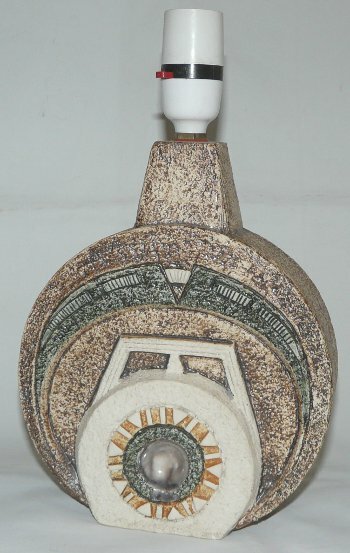 Condition: Excellent overall condition, a superb Troika lamp base. PLEASE NOTE this item is being sold as a decorative object. If it is to be used as a lamp it should be re-wired by a competent person before use.